When you stack the George A. Romero-penned, Michael Gornick-directed Creepshow 2 against the stomach-churning dung heap that is the impoverished, unrelated and late out of the gate Creepshow 3, it’s Citizen Kane. But when viewed as a follow-up to one of the greatest – if not the greatest – horror anthology film ever made, it just doesn’t quite cut the mustard. 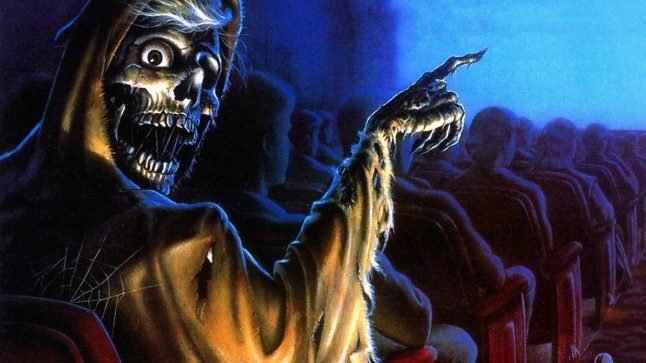 For a legion of fans, Creepshow 2 was a lunchbag letdown when it was released in 1987. Since then, this writer has tried time and time again to embrace the film and every time I emerge unmoved, unaffected, un-scared, un-dazzled and generally unimpressed. Which is not to say the film is not polished and professional. It’s a fairly well put together production. And, due to the fact that Romero wrote the screenplay and the tales were culled from – like the original – Stephen King stories and of course, the fact that Gornick was Romero’s longtime DP and the movie was co-produced by Romero’s frequent producer Richard Rubenstein, Creepshow 2 has the vibe of a vintage Romero joint and feels like it exists in the same pulp world that its predecessor does. And yet, it gets almost everything wrong that Creepshow got oh-so-right. From the opening moments, when The Creep opens the back of a truck and throws a stack of Creepshow comics at smiling young fan Billy, Creepshow 2 feels flat and tone deaf. Whereas the original had a histrionic opening goosed with the presence of Tom Savini’s bravura puppet creation giggling and beckoning out the window, this time we have a Howard Berger/Ed French mask molded onto Savini’s face, dubbed over with a gravelly, steroidal voice, a cheap and cheesy attempt to more faithfully quote Tales from the Crypt‘s Cryptkeeper character. It feels even cheaper when the sequence morphs into flat animation, with The Creep sitting in his castle narrating three tales (as opposed to the 5 in the original) of horror, none of which actually have the EC comics Grand Guignol sting that the first film so gleefully and effortlessly reveled in. The first story, “Old Chief Wooden Head” stars Hollywood vets George Kennedy and Dorothy Lamour as a kindly couple operating a general store in the desert. 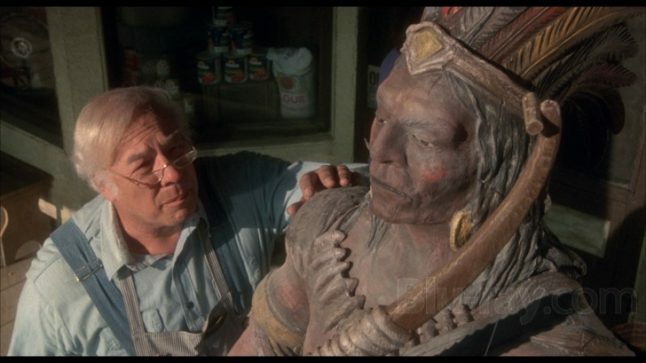 When a trio of toughs murder them in cold blood, the store’s resident wooden Indian comes to life and avenges his “friends”. This one is nasty and humorless, with nary a twist and no trace of irony whatsoever. Next up is the best of the three, “The Raft”, in which a quartet of horny teens ride out to a remote floating dock on a secluded lake and are immediately attacked by a blob in the water that eats them up one by one. Most fans and defenders of Creepshow 2 cite this episode as the highlight and it is, but that doesn’t mean it’s all that great and, again, there is none of the pervading sense of the macabre from Creepshow in here, not a whiff of the moldy comic book origins that are supposed to ground the film. Then there’s the final episode, “The Hitchhiker”, a formulaic action/horror riff that see Lois Chiles run over some poor schlub who then returns from the grave to torment her and repeatedly chants the often quoted line “thanks for the ride lady”. Once more, there’s no purpose to this episode, save for watching Greg Nicotero flexing the sort of prosthetic face carnage he would perfect in The Walking Dead. And that line, of course. To top it all off, Creepshow 2 has one of the worst horror film soundtracks of the 1980s, at least one of the worst from a film of this sort of pedigree. Where Creepshow‘s wildly evil tone was propelled by John Harrison’s nightmarish analog synth and grand piano score and Romero’s ace use of needle-drop library cues, here we have tinkly synth music from Les Reed and the great Rick Wakeman (Crimes of Passion) that sounds alternately like music from a Count Chocula commercial and leftover cues from a John Hughes comedy. Other features of note on the disc include a subdued interview with Savini discussing his 3 minute turn as The Creep and a lovely commentary by Gornick, who is such a gentleman, one feels guilty dismissing his feature debut so casually. Perhaps if Creepshow bore a different title, one that didn’t connect to such an immaculate film that stands as one of the cinematic highlights of two of horror and dark fantasy’s biggest and most important names, it would fare better. Maybe then, it would be a passable bit of pulpy distraction. As is, watching Creepshow 2 today is just as lame an experience as it was in 1987.